Ever heard of Buck Forage Oats and how it can help you during the hunting season? The secret to your deer hunting is here: Buck forage oats when to plant? Find out here. Out of all the cereal grains, this is what most deer enjoys. Summer is the best time to start planting buck forage oats. It is also known to be as the growing season for deer. Aside from that, you can save up a lot of money when you place it in your food plot. The ideal time to attract deer during fall! But the benefit of buck forage oats lies mostly on its ability to stay during the winter. When other plants freeze due to the temperature, buck forage oats will stay and stand through it – therefore making it also a good idea or option to be planted before the winter season. According to Dr. James C. Knoll, also known as Dr. Deer and distinguished whitetail authority and author of the best seller’s book (A Practical Guide to Producing and Harvesting Whitetail Deer) said that planting this kind of crop has three benefits: a) you will have fewer expenses than buying food rations, b) keep a greater amount of protein content for an extended period of time, and lastly, c) other crops become hard as they grow and at the same time their protein also decreases, but with buck forage oats, they grow larger but they are still tender which makes them appetizing for deer. What’s not to love about buck forage oats? It is also considered as a cover crop. If you’re not yet familiar with a cover crop, plants like this are known to destroy weeds, contributes to making your soil fertility and quality better gives you the power to manage diseases and pests and helps prevent soil erosion. They are often dubbed as green manure because they are very much alike in terms of what they do – providing nutrients to the soil. Buck forage plants, when to plant is during summer and one of the most significant things to consider is a location where there is a good state of soil moisture so that upon planting buck forage oats, germination will be rapid. Most cases show slow germination when there is no adequate soil moisture. For example, when there is severe drought. It is also important to note that you should choose a location that is easy to see to help you attract more deer. A good amount of wind is also a must in your chosen location! Having a steady stream of wind can help you cover your human scent which is an advantage when you are out there hiding just waiting for your kill. However, this technique is not 100% foolproof because even if there is a good amount of wind, it does not always equal to your target going in the same direction as your waiting spot. Make sure to get rid of all existing vegetation. You can do this by spraying a glyphosate herbicide. After this, disk the soil for 7 to 14 days. Fertilization is one way to ensure that you will have optimal results when you plant. In cases when you have lower or higher pH in soil, there’s also a solution so you can still choose the spot you are eyeing on. When there’s a low pH in your soil, put a ground lime to increase it. If there’s a higher pH in your soil than the standard given, use an elemental sulfur to lower it. The first step is to make sure that the ground is disked or tilled to soften the seed bed. Next is to scatter or drill seed about 100 to 200 pounds per acre. If you engage in scattering seeds, you need to re-disc your plot with the disc blades 4 inches deep in order to get satisfactory results. On the other hand, if you engaged in drilling, set your drill maker 2 inches deep in the soil. Thereafter, cover what you planted with 2 inches of tilted soil and water. Compared to other oats and plants, it can give you an assurance that it can persist during freezing weather and still give you a high yield in your crop. Check out 1/2 Acre Buck Forage Oats Food Plot - "December Update"
As stated in the discussion, buck forage oats can be planted all throughout the season as long as there is a good soil moisture in the area (except for extreme heat like those experienced in the desert area). 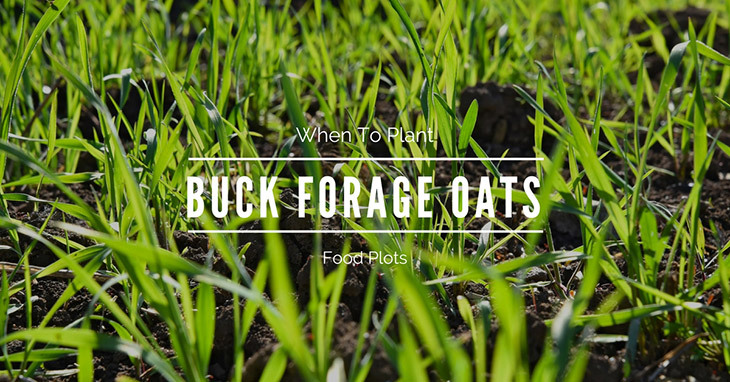 But buck forage oats, when to plant is recommended during summer, just in time for their growing season. Not only that, it is also a cover crop which means that you can also mix it up with other crops and help alleviate the pests around the area. Buck forage oats, available in every season which only means one thing – plan and strategize every season because you have plenty of chances to attract your kill. This deer fix might just get you addicted.